In the previous post dedicated to the email spam statistics for August 2012, we have highlighted the 7 most important tips to stop junk mail. This list of spam prevention techniques definitely has to be extended and requires a dedicated blog post, so here we go! 1. Do not use your primary email addresses when registering online. If you don’t want to have your corporate or private email address jammed with spam – do not use them when registering for online promotions, contests, giveaways, download sites, etc. 2. Use a “disposable” email address for online registrations and one-time downloads. You can always create a new email account using free email providers like Gmail, Yahoo!, or Hotmail. You don’t even need to waste time checking this email account for new messages, since you only provide the address to websites and forums as a log-in, and not to your friends or work contacts. If you are your own IT administrator, you can ask your email provider for a catchall service and then, when you signup anywhere, you can describe where you’re signing up before the @ sign with your domain name following (example: forumname@yourdomain.com). With this method, you can just block all emails to that email address if you start getting spam for it. 3. Do not post your email address in public profiles visible by everyone. Keep from posting your email address on forums, blogs and public profiles. To automate the process, spammers use automatic programs to harvest emails, so you provide them with easy food when posting your email here and there. If you really need to post your address, disguise it from the robots. You can choose to substitute some characters and separate them by brackets – so that your email address no longer looks like one. For example, if your email is “jack.rabbit@example.com”, write it out as “jack.rabbit [at] example [dot] com”. 4. Make your email address hard to guess. Some spam-sending programs coin email addresses using a combination of the randomly-used names and last names, and then send spam to the list of the newly created email addresses. If you don’t want to be included in such a list by accident, make sure to create an email address that is unique. 6. Keep away from opening spam messages. When you open an email with graphics rendering turned on, the sender might receive an email delivery receipt which lets them know that your email address is valid. If you were using EmailTray, described below, spam messages would appear in the lower priority Inboxes where graphics rendering is automatically shut off. 7. Do not follow the links in a spam email. Such links might include malware which might result in identity theft. Even if you believe an email is legit, hover over the link with your cursor first to verify that the URL you’re being sent to is also legit. 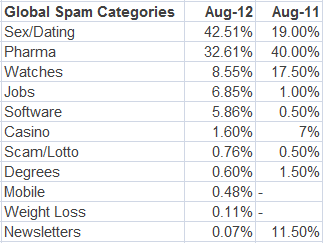 Email Spam Rates in August 2012. How Do They Stack against the Previous Year Stats? According to Symantec.Cloud data updated on a monthly basis, March and April 2012 were the lowest months for spam attacks within the last 12 months. 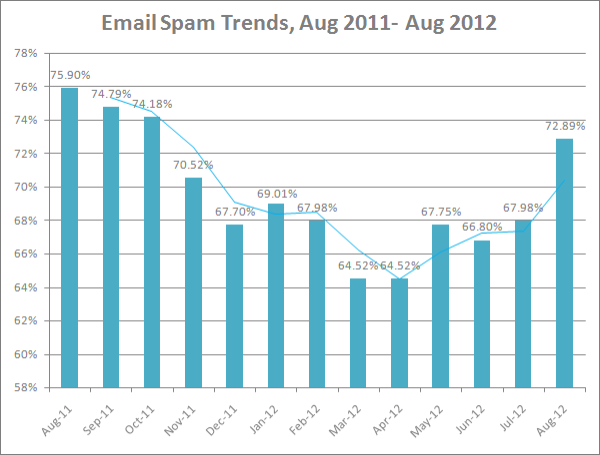 As we can see from the chart below, May 2012 showed a rising trend and email spam reached a whopping 72.89% rate in August 2012. 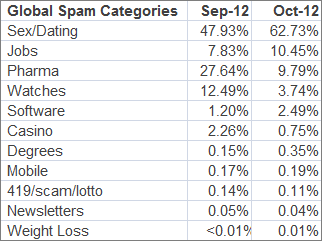 It is interesting that the spam rate in August 2011 was almost the same: 75.9%. As stated in the Symantec Intelligence Report issued in August 2012, the highest volume of spam was detected in the electronic mail of Saudi Arabian users: 83.3% of all their mail was spam. Norway comes next in the list, with the rate of 78.1%. Chinese users received 77.6% of spam messages; Oman email users experienced a 77.3% spam rate and Brazil users – a 76.7% spam rate. 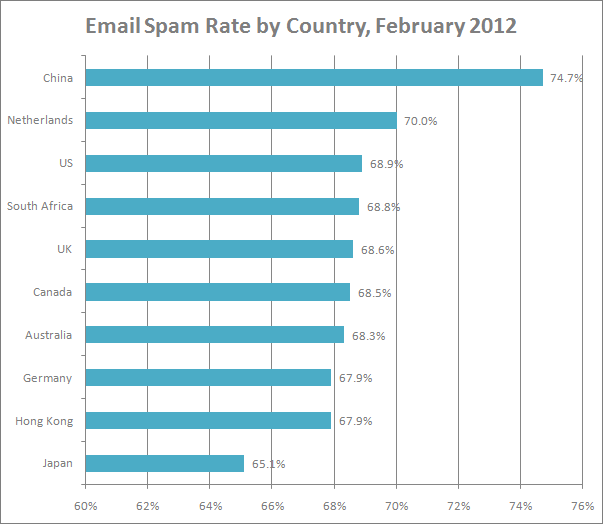 As we see, email users from Saudi Arabia and China suffer from spam more often than the rest of the world. Do not give away your primary email address when registering online. Use a secondary or special address for registrations. Unless you are a salesperson, don’t include your email address in the public profiles visible by everyone. Choose an email address which is difficult to guess. Never respond to spam emails such as by asking to unsubscribe – this will confirm your email address validity rather than unsubscribe you. 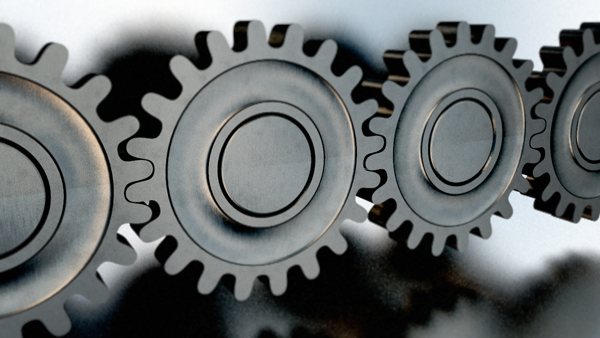 Use a spam filter on your computer or in your corporate network. Use the “Report spam” option within your email client so that you never receive emails from this sender again. Update your anti-viral software on a regular basis. We never stop saying that you should also try EmailTray – not only because this is our offspring project, but also because it is a really smart email client offering powerful email prioritizing features. With EmailTray, you will be focused on good mail rather than junk mail, so go ahead and download EmailTray for Windows, or grab your smart email app for Android at GooglePlay! Email spam and phishing are serious obstacles on the road to efficient work flow and email productivity. Spam messages clutter your Inbox, distract your attention and absorb your work time while you revise and delete them. Spam emails may contain malware or links to malicious websites, thus putting your computer at risk. Moreover, a large amount of daily spam can make you feel stressed and totally exhausted. Spam can be deemed less harmful if compared to the fall-outs of phishing. Phishing emails may jeopardize your virtual identity and your financial estate – if you don’t use anti-phishing tools, forget about security and don’t follow the advice on how to avoid scams. Can you imagine that about 68% of all emails that people receive daily are nothing else than spam? That is a big statistic, especially if you take into account the time that you normally spend on managing your Inbox and sorting emails. The good news is that the spam rate has been decreasing over the last 3 years, and hopefully it will keep on decreasing along with the shutdowns of spam-spreading botnets. 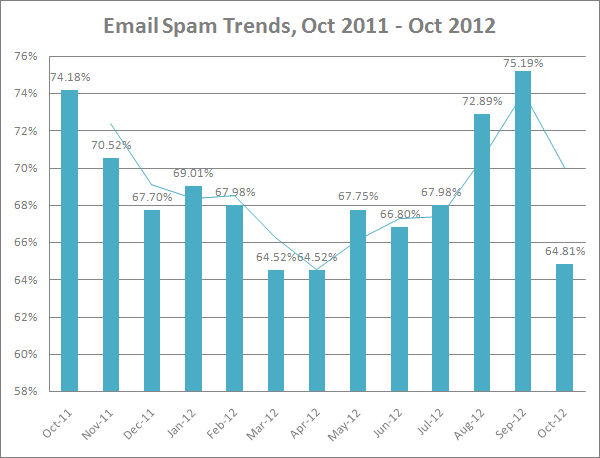 The other good news is that you can use intelligent email software to prevent spam and manage your Inbox effectively. Try out the EmailTray email client for Windows or the EmailTray app for Android and see the difference in email productivity before and after using these email programs. According to a Symantec Intelligence Report issued in February 2012, one of the most spam-affected countries was China. 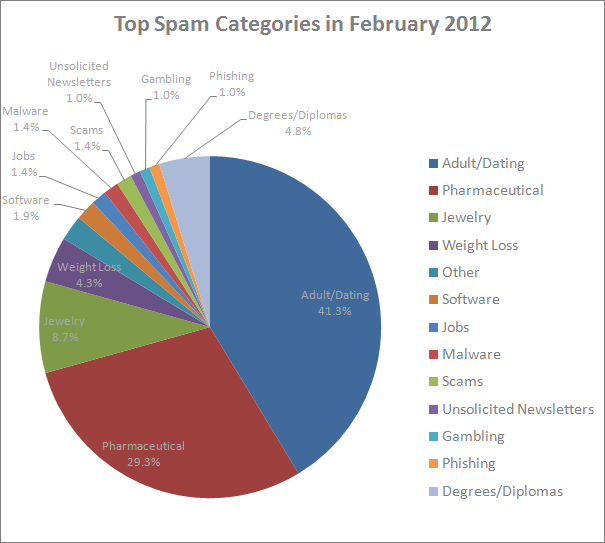 As of February 2012, nearly 74% of all mail received by Chinese users was spam. The Netherlands and the US crowned the list as well by showing the rates of 70% and 68.9% of spam of all incoming mail respectively. 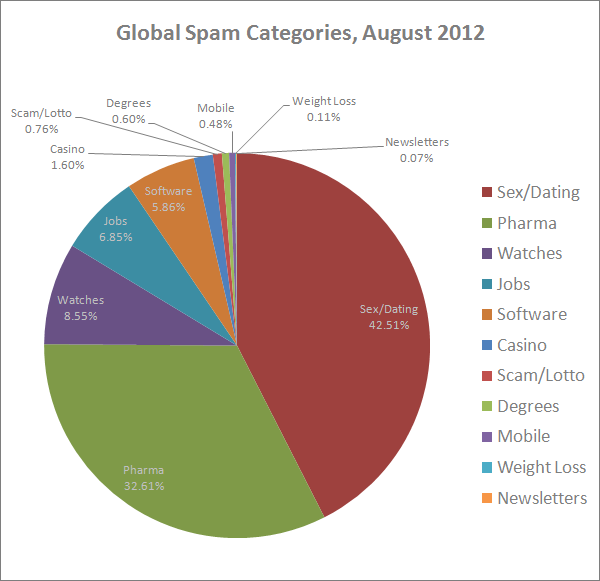 The most popular spam categories are dating, pharmaceutical, jewelry and weight loss; adult-related messages are found in nearly 43% of all spam. Email phishing is harder to do yet the fall-outs are much more dramatic. Unfortunately one of 298 emails that we receive daily is phishing. Each phishing attack puts your identity at risk and compromises the brand being phished, since the phishing victims constantly lose trust in the brands and service providers which have suffered from the phishing.